In a district ruled by a powerful sand mining mafia, police booked two journalists as spies and detained local reporters for helping them. 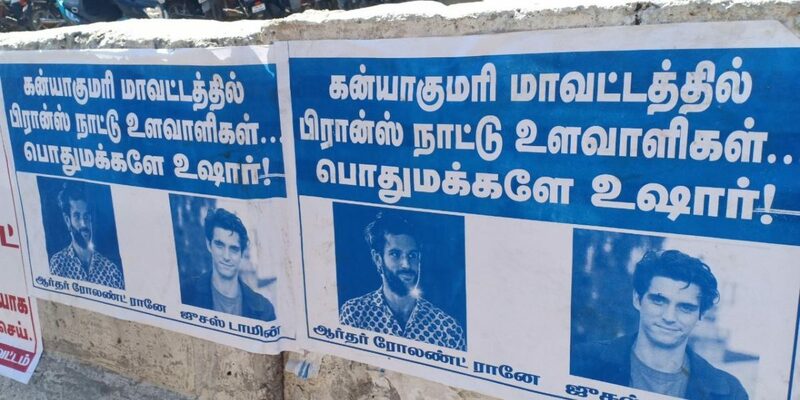 Posters put up by the Kanyakumari BJP which reads: "Public beware – there are French spies in Kanyakumari district". 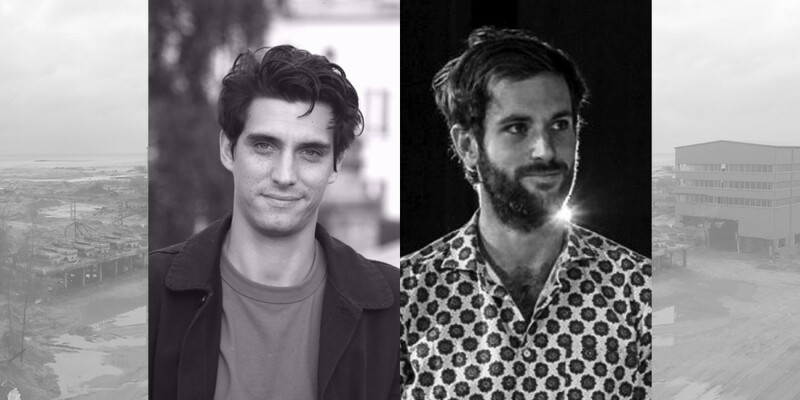 New Delhi: In November of this year, journalists Arthur Bouvart and Jules Giraudat arrived in Chennai. They belong to a French organisation, Forbidden Stories, which travels the world to complete investigations by local reporters facing ‘threats, prison or murder’ – which many Indian reporters have faced for investigating illegal sand mining. Ironically, the visit ended with the duo accused of spying – and two reporters from the area, D. Anandhakumar and M. Sriram, held and interrogated by police. The trouble began when the French journalists visited Indian Rare Earths Ltd (IREL) in Manavalakurichi, in Kanniyakumari district, escorted by an activist on November 26. IREL is the Central government’s beach sand mining agency under the purview of the department of atomic energy. It is a prohibited and high security zone. Bouvart told The Wire that they entered the plant with permission, went directly to meet a manager, and left as soon as they were asked to. Police have registered a case against them for criminal trespass, read with sections of the Foreigners Act 1946: 14A (entry into restricted areas), 14B (using forged passport) and 14C (abetment). However, they were unable to make an arrest as the duo had left the country by the time the case was registered. Instead, the deputy superintendent of police detained Sriram and Anandhakumar – who say they had neither accompanied the French journalists to IREL, nor had any knowledge of their plan to enter there. The Chennai-based journalists were held for several hours, and were reportedly questioned by the representatives of the Intelligence Bureau, state intelligence, Q Branch, and the Central Intelligence Directorate, with DSP Bhaskaran acting as the investigating officer. “To our shock, we were illegally detained at the DSP’s office and questioned for hours. We were asked to sign a statement, which we did. After that we were taken to Sun World Hotel in Kanyakumari and locked up … for almost six hours,” Anandhakumar said, according to the Times of India. French journalists Arthur Bouvart and Jules Giraudat. The DSP allegedly told the journalists to not talk about beach-sand mining. During the questioning, Bouvart and Giraudat made a video call to the police station and showed their press credentials. After a few hours, Sriram was told to return to the hotel, while Anandhakumar was detained at the Kanyakumari police station. After several journalists called the DSP to ask why Anandhakumar was being illegally held, he was taken to the hotel late at night with four policemen outside the room. The next day the two journalists were again taken to the police station for more questioning. It was only after senior lawyer D. Geetha intervened that the two journalists were released by the Kanyakumari police, after two days in custody. The superintendent of police, N. Shreenath, has since given contradictory statements to the media – first that the French journalists were stopped at the IREL gate, but trespassed; that they ‘videographed the sensitive installation after trespassing into the prohibited zone’; and that the journalists did not take pictures or videos inside the premises of the IREL. Pon Radhakrishnan, the BJP MP from Kanyakumari, had earlier made a statement to press that the French journalists were spies who “arrived by sea” to commit “a treasonous conspiracy”. On December 3, the local unit of the BJP held a press conference demanding an investigation into French journalists and locals who had helped them, including environmental journalist Sandhya Ravishankar, who introduced them to the French team. In 2017, Ravishankar wrote an in-depth, four-part investigative series about illegal sand mining for The Wire, and faced an alarming backlash of threats and harassment. This article was updated on December 3, at 3.45pm, with details of the BJP unit’s press conference and the mention of journalist Sandhya Ravishankar, and at 6.35pm, with details of the press conference in Chennai and the remarks by N. Ram.